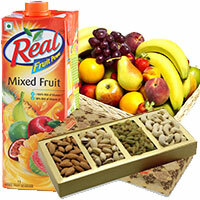 Dry Fruits and Rakhi Delivery Send rakhi to Mumbai with dry fruits for your brother to feed after tying rakhi to him. Buy online rakhi and rakhi gifts to Mumbai from Mumbaionlinegifts. Mumbai online gifts understand your needs and the importance of the festival of Rakhi, thus we offer a wide collection of rakhi gifts ideas that will convey your feelings in a special way. We bring to you the colourful and vibrant range of rakhi and rakhi gifts that has some unique gifts like Dry fruits, Cakes, Cookies, Chocolates, Sweets, Flowers Greeting Cards and so on. You can send rakhi with dry fruits to Mumbai for your brother to feed after tying rakhi. To make your shopping experience an ease, we have given collections of rakhi with dry fruits to send on rakhi for your brother. Place order now just in few clickes to send rakhi and rakhi gifts to Mumbai and to Send Rakhi Gifts to Navi Mumbai, Rakhi Gifts to Vashi, Rakhi Gifts to Thane, Rakhi Gifts to Panvel, Rakhi Gifts to Pune same day with free delivery of rakhi gifts in Mumbai and around Mumbai.